We hope you enjoy your new newsletter – from now on we are combining the Lama Zopa Rinpoche News and the FPMT General News into one wonderful FPMT NEWS. The FPMT NEWS will come to you every month. We hope you enjoy reading it! At the request of the organizers of Milarepa – The Movie, Lama Zopa Rinpoche was recently filmed talking about Milarepa. This talk will part of be a 30 minute special feature on the Milarepa DVD that will include a number of other lamas. The filming took place recently when Rinpoche was attending Geshe Sopa Rinpoche’s teachings in Deer Park, Wisconsin. Geshe Tenzin Dorje of Institut Vajra Yogini, Lama Zopa Rinpoche and Geshe Sopa Rinpoche taking a break during Geshe Sopa’s teachings at Deer Park. For the detailed schedule and details of how to contact the center and book for these events, please go to Rinpoche’s Schedule. Rinpoche will be giving teachings on the Three Principal Aspects of the Path and 21 Tara initiation at Guhyasamaja Center, USA on Oct 20 – 21. He will then teach at the Kopan November course towards the end of this year. 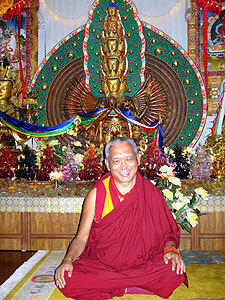 Rinpoche will teach at Root Institute, Bodhgaya, India from Dec 28 2007 – Jan 2 2008. By mixing with people who have a totally different culture, and then being able to live in your practice, the vows, well then that’s being a really great hero, that’s a great challenge. This hero is unbelievable. This is the hero over the delusions, not a hero from killing many millions of people, the hero regarded by worldly people as a hero. Here, this is a real hero – the real hero is a hero over the delusions, who is able to conquer the delusions. 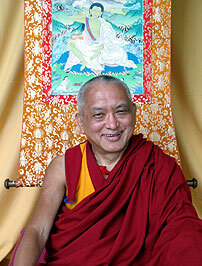 Lama Zopa Rinpoche in his room at Kopan Monastery, Nepal. FPMT resident geshes waiting to greet His Holiness. For all center directors, spiritual program coordinators and FPMT teachers – these minutes (which are in the FPMT Affiliates Area) have some excellent and useful advice, from Rinpoche, Khenrinpoche Lama Lhundrup, Ven Roger Kunsang, and of course the FPMT resident geshes. Plus there are some lovely photos! “We, the geshes, should organize long life puja for Rinpoche. Having said that, since we are all working to fulfill Rinpoche’s holy wishes, thus I feel that to be able to do that in itself is making a real long life puja to Rinpoche. Even today this very meeting also pleases Rinpoche. His Holiness the Dalai Lama is also very pleased. For all this to continue it is extremely important for Rinpoche to live long, for hundreds of years. In every country wherever there are Dharma centers established, peace is being established. Therefore it is very important for Rinpoche to live long. 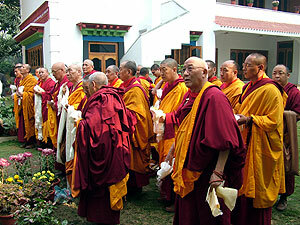 We, all the geshes, must unite and go according to the holy wishes of Rinpoche. Up to now you have worked very hard and will continue to do so in the future. This is from all us geshes [Lama Lhundrup offers a khata to Rinpoche] together requesting Rinpoche to live long and with our promise to you that we all will work hard into the future. There have been very auspicious dependent links, and we are able to live with positive dependent links of conditions so thank you very much Rinpoche for that. Our new-look website fpmt.org/mandala (thanks to our web developer, Adam Payne) is attracting more visitors, so we thought we’d give you something extra – a regular selection from the ‘best of Mandala’. And with the latest Mandala now out, we hear there is a resurgence of interest in going on retreat to places as tranquil as the cover! But one thing we are really waiting for – brilliant photos that say, simply: “LOVING KINDNESS”. We have extended the age restriction so now it’s open to anyone, not just the youngsters. So – what says “LOVING KINDNESS” to you, and how would you capture it in a photograph? Send hi-res images to editor@fpmt.org. The new edition of Discovering Buddhism for centers is now available! If your center has purchased the previous edition and is currently hosting DB, please send an update to Heather that includes details on how the program is progressing, your schedule and who is teaching and she will send you a complementary disk of the 2007 edition. The next Masters Program, starting January 2008, promises to become an unprecedented occasion, with an impressive number of students (among them about twenty Basic Program graduates) and an impressive staff (among them several MP graduates)! It will be preceded by a three month intensive Tibetan language course taught by Gavin Kilty. But, if you can’t make it to Italy for six+ years of residential, intensive study, there is another option: the Masters Program On-line! This program runs parallel to the residential program and is offered in both English and Italian. The Masters Program On-line – the modern equivalent of a home study or correspondence course – will use services offered by Moodle , an open-source program especially designed for distance learning programs. Check out what is being offered at Masters Program On-line. FPMT International Office has often been requested to provide a template for an FPMT study group/center’s website. Upon consideration we feel that this will not work and that it is better for study groups/centers to create a connection with a web person as you will always need that person to add new content to your website. So, instead we have created a guide which FPMT study groups and centers can give to your web person so that firstly they can make your website similar in design to the FPMT site, and which they can then use at various levels depending on their proficiency. 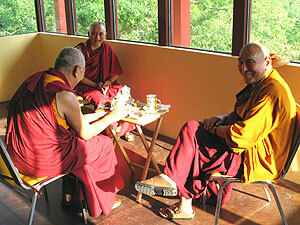 FPMT centers and study groups can read our guide here. 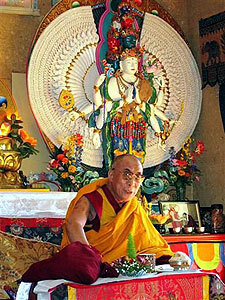 His Holiness visiting Thubten Shedrup Ling Monastery in Australia. This e-mail has been sent to the FPMT General mailing list. Your email address has not been given to any Third Party. The FPMT controls all e-mail delivery to assure your privacy.